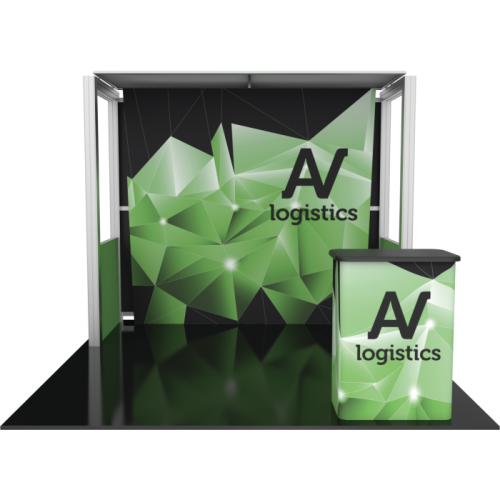 The Hybrid Pro custom trade show booth has a stylish and finished look with a sleek canopy and half walls to create a semi-private enclosed feel. Enclosed modular exhibits have depth and dimension making it a great way to establish yourself as a veteran at any venue. The modular display frame is heavy-duty and durable. With available features like push-fit graphics, shelving, tables, monitor mounts, storage areas, and much more. The Hybrid Pro Modular series is a cut above the rest when it comes to quality. Make yourself stand out at your next event with the Hybrid Pro series backwall. Trade Show Backwall Hybrid Pro 10ft Exhibit Kit 01The Hybrid Pro custom trade show & exhibit di..
Inline Exhibit Booth Hybrid Pro 10ft Modular Display Kit 02The Hybrid Pro custom trade show booth ..
Trade Show Booth with Illuminated Graphic Panel and Counter Hybrid Pro 10ft Kit 03The Hybrid Pro cu..
Tradeshow Hybrid Pro 10ft Custom Modular Backwall Kit 05The Hybrid Pro Kit 05 custom trade show boot..
Tradeshow Display Hybrid Pro 10ft Modular Backwall Kit 06Hybrid Pro™ Modular Kit 06 is an eye-catchi.. Hybrid Pro 10ft Modular Backwall Kit 07Hybrid Pro™ Modular Kit 07 is a striking 10ft x 10ft inline d..
Tradeshow Custom Hybrid Pro 10ft Modular Backwall Kit 08The Hybrid Pro Custom Modular Kit 08 is an i.. Custom Modular Hybrid Pro 20ft Backwall Kit 09The Hybrid Pro 20ft custom trade show booth Kit 09 is ..
Tradeshow Hybrid Pro 20ft Modular Backwall Kit 10Hybrid Pro Tradeshow Modular Kit 10 is a stylish mo..